We’re huge fans of furniture from the 1930s to the 1960s, the period that’s generally described as mid-century modern. We don’t mean the more kitsch American ‘atomic age’ stuff, rather what we’re interested in is the well-thought-out and well-made furniture that started being produced in Denmark and then spread to other parts of Scandanavia before its humane principles spread more widely. This kind of furniture varied quite widely from traditionally made pieces from skilled cabinet-makers all the way through to proto-Ikea type democratic kit-furniture. Many of the classic designs from this period are still being produced of course and you’ll find things like Arne Jacobsen’s Series 7 chairs in dining rooms and offices all over the world. We wanted to take the opportunity when we had built our new house to find some really good pieces from this period, whether vintage or new. However, we have to be patient and very selective as we don’t have a lot of money, and there really isn’t a great selection available in Ontario, which was still very conservative and still very much a farming-dominated economy during the mid-century period, so local sales sites like kijiji aren’t that great and vintage stores have very limited selections of truly good stuff. 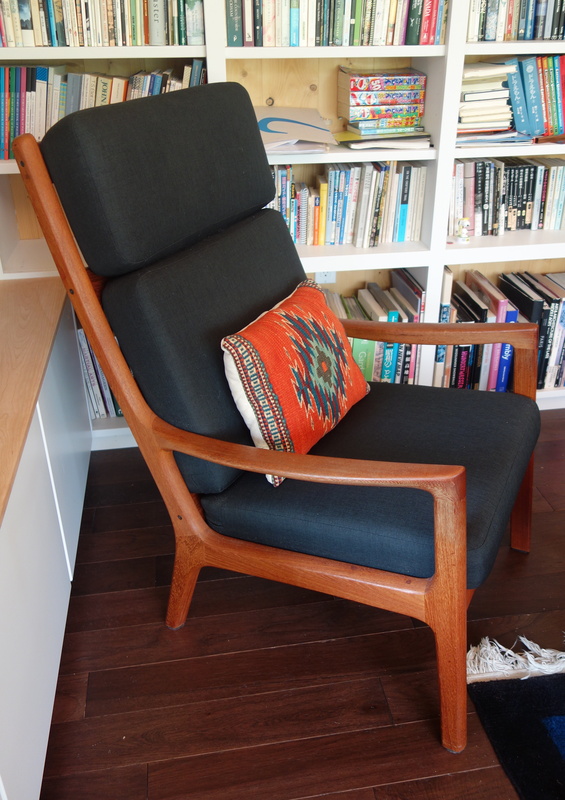 There are excellent European vintage sales site aggregators, in particular Vntg.com (formerly known as Retrostart), however shipping costs are prohibitive for anything bigger than a single lounge chair. North America has sites like Chairish as well as the ludicrously expensive, 1stDibs, and of course you can try your luck with ebay and even etsy (you might be surprised…). Shipping from parts of the USA can also be ridiculously expensive, although services that find spare space with existing delivery services, or act as a clearinghouse for local movers and shippers, can sometimes come up trumps. UShip seems to be the best of these. Anyway, what did we get and why? Here, we wanted a couple of really comfortable armchairs and a daybed for, well. lounging. Early on, while we were still starting the build, when we still thought we had money over, we found our vintage armchairs, both Danish from the early 1960s: a classic Senator high-back armchair and foot stool designed by Ole Wanscher, and one perfect oak-framed armchair designed by Hans Olsen. 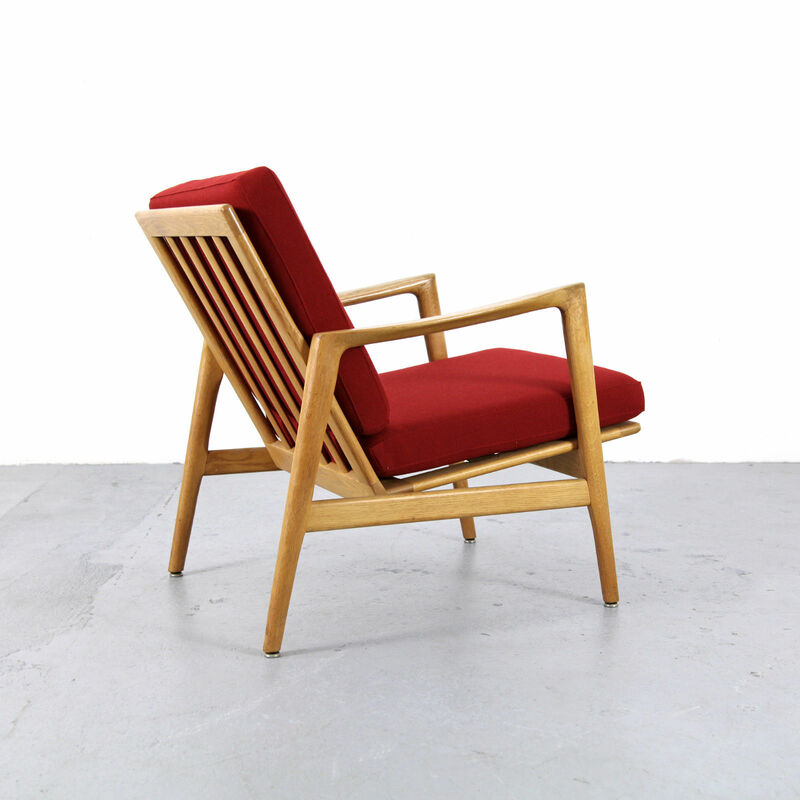 Senator high back armchair in teak by Ole Wanscher for Cado (early 1960s). The Senator series was originally made by PP Jeppersen, and this original version is more expensive. Ole Wanscher had a reputation as being relatively conservative compared to his contemporaries, however this is perhaps as much due to his manner as his designs. In fact he could be remarkably innovative, and the design of the Senator series lent itself to a more reproducible iteration, which was duly created by Paul Cadovius’ firm, Cado, which became famous mainly for its modular wire-frame and teak shelving systems. This version screws together in a way that Ikea made the basis of its entire business model. However, the Cado chairs fit together beautifully, the quality of the materials is way above what Ikea offers. They look almost exactly the same, except for the screw holes. And the extra advantage of the Cado version is that you can have them shipped more affordably, because they come apart. Hans Olsen is one of the less known of the major Danish designers of the time, but he’s one of my favourites, and I think his Easy Chair (1955) is simply perfect. For various reasons I am not really a huge fan of teak, the wood that was used in by far the majority of Danish furniture in the 1950s, and were fortunate to find a perfect example in oak. For the daybed, we wanted something relatively low, that wouldn’t go above the level of the large south-facing windows’ lower frame, but which had moveable cushions. That eliminated my favourite Danish vintage daybed – the ‘Minerva’ model by Hvidt and Molgaard. We also decided that we wanted some lighter wood as our floors are very dark. So in the end, we bit the bullet and ordered a new Artek 710 bent birch daybed. When we say, ‘new’, we mean in production terms – the design is an early (1933) mid-century modern classic by Finnish architect and designer, Alvar Aalto. 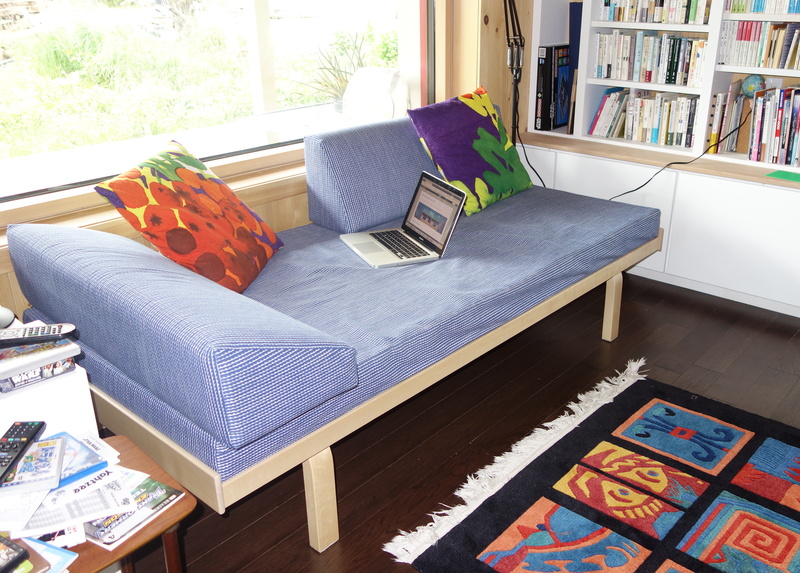 We bought it with the cushions uncovered, and got hold of some new Artek-designed fabric separately in a sale, and Kayo made some removable covers, as well as using some of the Marimekko fabric from the curtains she made for the old house to recover some cushions. As it happened, the same place we got the daybed, an Artek dealer and slightly eccentric vintage furniture shop in Toronto, Studio Pazo, also had some sale-priced Artek Chair 69 bent birch dining chairs, , also designed by Aalto in 1935. These ones had coloured seats and backrest, one on each of the six colours they do. We decided these would be perfect for the dining table. New Chair 69 by Alvar Aalto for Arkek, originally produced in 1935. To add to these, as a present to my wife, who had always wanted a Wishbone Chair, otherwise known as the ‘Y Chair’, designed by the brilliant Hans Wegner in 1950. I secretly ordered a pair of special limited editions of this classic design in elm, from the original manufacturers, Carl Hansen & Sons. It’s amazing to think that these are just about the cheapest Wegner chair you can get and, well, they weren’t cheap. But they are probably the most perfectly satisfying chairs I have ever seen, both comfortable and beautiful. These chairs will all go around our existing locally made reclaimed pine dining table. 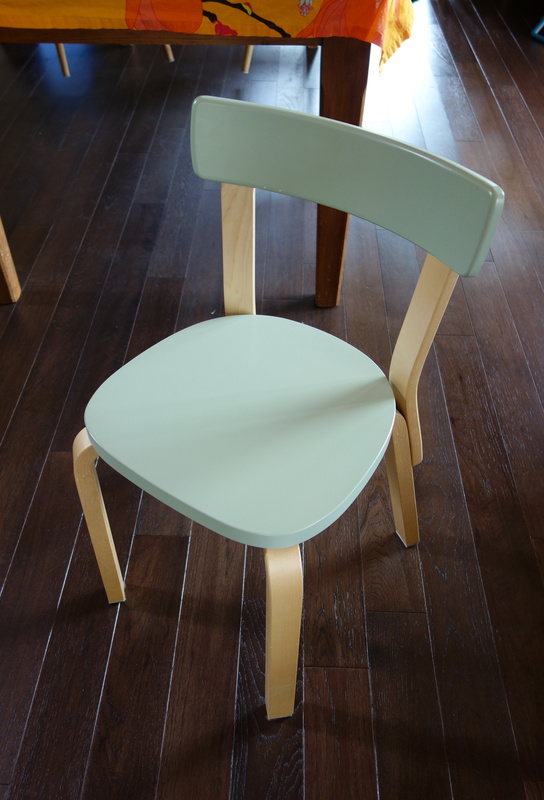 Wishbone (‘Y’) Chairs in elm (Hans Wegner for Carl Hansen & Sons). This entry was posted in dining room, furniture, lounge and tagged Alvar Aalto, Artek, Balloon Chair, Cado, Chair 69, danish modern, daybed, dining chair, easy chair, Hans Olsen, LEA, lounge chair, mid-century modern, Ole Wanscher, Paul McCobb, scandanavian modern, Wishbone Chair, Y Chair on May 20, 2018 by David. Now, finally, it is the Japanese room! After the excellent bookshelves downstairs done by Jeremy Balint, this time it’s the work of another brilliant local carpenter, Joe Calnan. Joe is multi-talented as you can see from the projects on his website: historian, educator, guide, boatbuilder, historic building restorer – and just occasionally, lucky people get to have him do some interior woodwork. We had him in mind for this project from the beginning as he’s also interested in Japanese joinery, and we’re delighted he was able to find the time to fit us in. What we are calling the Japanese room is a typical multipurpose space that would be found in a small house or apartment in Japan, known as a washitsu. Japanese rooms are generally measured by floor area, in tatami. Tatami are thick mats woven from a special grass straw and filled with another kind of grass stuffing (although many these days have some kind of artifical foam instead), often edged with fabric. The sizing is slightly complicated by the fact that tatami are traditionally slightly different sizes in different parts of Japan, but generally they are around 90cm x 45cm and arranged in various different patterns depending on the exact shape of the room. We had designed in this space along these dimensions from the beginning, to be a 4.5 tatami space (yojohan), plus tokonoma (alcove) and chigaidana (cupboards). In most traditional rooms, the tokonoma and chigaidana are next to each other, split by a tokobashira, a pillar that is often deliberately rustic, and sometimes even just a whole tree branch. However, in some the alcove and cupboards are arranged vertically, and this is what we decided to do because it makes the cupboards, in which we will store guest futon mattresses, more easily usable, and it also makes more a potential feature of the top of the low cupboards. We will still have a tokobashira in the centre but the ash branch from the island we are going to use is still still drying. The tokonoma has certain other traditional features too, usually a flower arrangement and scroll, both of which are changed seasonally or more frequently. Ours also has an otoshigake, a valence at the top of the alcove. The room is not divided from the upstairs hallway by walls and a door but by shoji, translucent sliding screens (although it could also be fusuma, which are opaque screens). Our tatami mats and shoji screens both came from the Vancouver-based Lilin, who were really excellent to deal with and very reasonably priced for quality products. The shoji are made of fir, and this really determined the choice of the rest of the materials in the room – and outside. We had already choicen to use a fir top for the stair rail, and Joe used fir for the frame post and kamoi (top rail) for the shoji, and carefully matched pieces of fir for the valence and the cupboards. The tatami mats are held in place by a narrow fir frame and the base of the sliding screens and cupboards. However, the shikii (base rail) for the shoji is clear maple, the same as the floor of the upstairs landing. Maple is also much harder than fir, which makes it more suitable for the shikii, which will need to be hard-wearing. We’ve generally tried not to use any foreign or unsustainably-harvested wood for any part of the house, but Joe had a large piece of Honduras mahogany, which he has had in the store in the back of his workshop for quite a few years, which was absolutely beautiful and was almost exactly the right size for the cupboard top. All Honduras mahogany is now supposed to be sustainably harvested or cultivated, and this was certainly not from Brazil, where that is often not the case and mahogany is frequently illegally harvested. The tokonoma is lined in this really special hand-made silk wallpaper from Ubushina in Japan, which has ‘grain’. Inspired by pictures on their website, we decided to hang it as equal size squares, alternating the direction of the grain for each so that the light would catch it in different ways. It made the cutting and hanging processes a little more complicated but the result is beautiful. And finally, we sorted out the lighting. The tokonoma is lit by a flexible LED strip around the inside of the valence. This can be set to all kinds of color outputs, and even has some sort of ‘disco’ settings, which FK loves, but generally, a warm yellow light works best with the wallpaper and wood. The main room light is another one from Toshiyuki Tani, who also made the birch-bark shade in the lounge. It’s a simple washi-paper shade in the shape of Mt Fuji. Overall, we are delighted with the room. This entry was posted in finishing, flooring, furniture, lighting and tagged cabinets, carpenters, ecohouse, Japanese room, passive house, passivhaus, tatami, tatami room on February 23, 2018 by David.